Trevor Dion Nicholas, who's played the Genie in the London production of Disney's Aladdin since the musical opened in 2016, will join the show’s North American tour for a limited engagement this summer, including a three-week engagement in his hometown of Pittsburgh, before returning to the West End. Nicholas will trade places with current U.S. tour Genie Michael James Scott, who will play the role in the London production August 17 through September 30. Nicholas was in the Broadway production of Aladdin before originating the role of the Genie in London’s West End. Nicholas’ other stage credits include Dreamgirls, Big River, Super Fly, Ragtime, The 25th Annual Putnam County Spelling Bee and The Wiz. 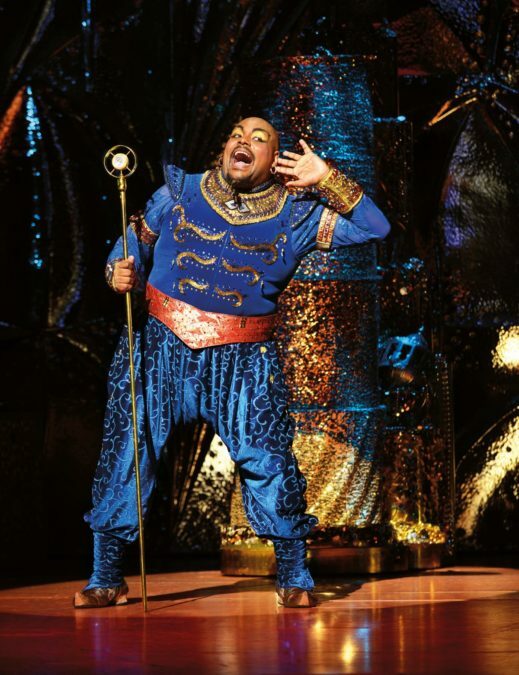 "My time with Aladdin in the West End so far has been absolutely incredible, but the opportunity to perform as the Genie in Pittsburgh on The Benedum Center stage, where I saw numerous shows growing up, means so much to me and those I love," said Nicholas, in a statement. "It’s a dream come true to perform for audiences full of family and friends in a city so close to my heart." In addition to Nicholas, the North American tour cast of Aladdin will feature Clinton Greenspan as Aladdin, Isabelle McCalla as Princess Jasmine, Jonathan Weir as Jafar, Jerald Vincent as the Sultan, Jay Paranada as Iago, Mike Longo as Kassim, Philippe Arroyo as Omar and Zach Bencal as Babkak. Aladdin is currently running on Broadway at the New Amsterdam Theatre. The production officially opened on March 20, 2014, and was nominated for five 2014 Tony Awards, including Best Musical, Best Original Score and Best Choreography. To find out when Disney's Aladdin is headed to your city, click here.